Philadelphia, Miss. — Emily Dannenberg stepped off an air-conditioned tour bus into oppressive Mississippi heat. 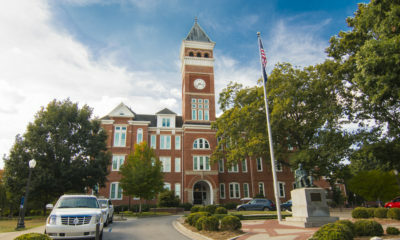 The white Columbia University graduate student had come to this steamy rural town last week with a mission: to mentor both black and white teenagers and help them make sense of their state’s violent and racist past. 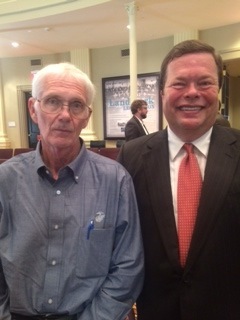 “I’d always been biased against this state, without ever visiting it,’’ said Dannenberg, standing near a memorial to civil rights workers Andrew Goodman, James Earl Chaney and Michael Schwerner, who were arrested, kidnapped and murdered during the massive volunteer effort known as Freedom Summer 50 years ago. 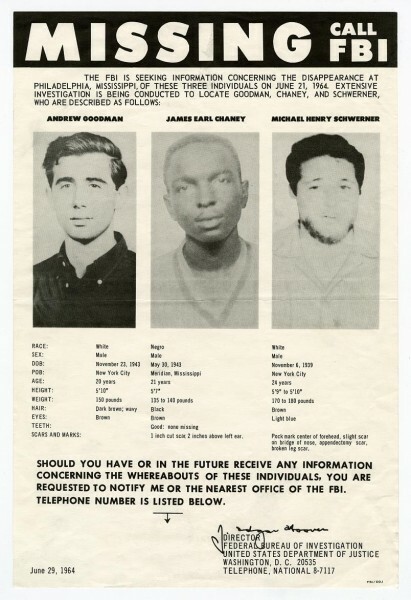 The three activists were setting up schools and registering blacks to vote in the Jim Crow south when they encountered fierce resistance from the Ku Klux Klan and local law enforcement. In 1964, resentment of northerners invading their home turf on a mission to expose brutality and discrimination reached a deadly crescendo. 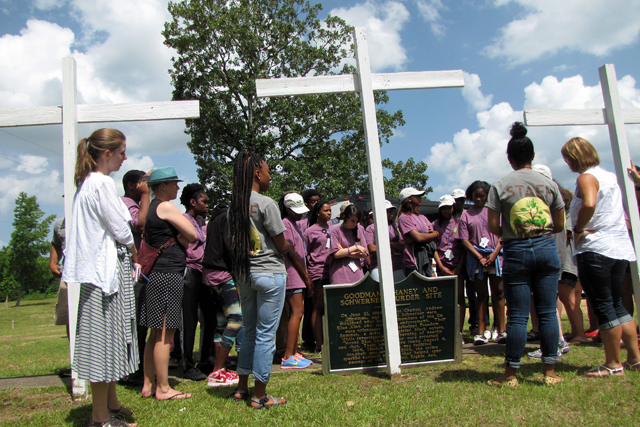 Fifty years later, Dannenberg and a busload of high school students from the William Winter Institute for Racial Reconciliation summer youth institute confronted the Magnolia State’s tormented legacy, including the so-called “Mississippi Burning,’’ murders. This week, activists from all over will visit Mississippi to commemorate the events and “teach greater moral bandwidth for a new generation,’’ according to organizers of Freedom50 events. In the tiny town of Philadelphia last week, many students on Dannenberg’s tour said they grew up in the shadow of horrific historic events, but knew little about Freedom Summer and the sheer racist terror that characterized the era. Miracle Hunter, a 16-year-old black high school student from the Mississippi town of Cleveland, said she was unaware that so many Freedom Summer volunteers were white. Before the bus tour, the 27 students and their 14 mentors watched the documentary Neshoba and a new Freedom Summer film, chilled by footage of the trio’s burned-out blue Ford Fairlane as the FBI dragged it from the Bogue Chitto swamp near Philadelphia on June 23, 1964. A horrified nation knew that instant that the men were likely dead. Scores of students who were about the age Dannenberg is now, were told that if they cared about Democracy, they had to come South — even though in Mississippi, at that moment, they faced imminent danger. It took another 44 days after the grim discovery of the station wagon for the badly beaten bodies of Goodman, 20, Chaney, 21, and Schwerner, 24, to be found — down a dirt road and buried beneath a newly constructed earthen dam on a privately owned farm. Myeisha Jones, 18, grew up in Philadelphia not far from the Mt. Zion Church burned down by the Klan in their effort to find Schwerner. She didn’t know about the case before attending a summer seminar at the Winter Institute, where she is now a junior mentor. She says her own family shuts out the conversation. Molpus toured Freedom Summer sites last week with David Goodman, watching as the younger brother of the slain civil rights worker gathered stones to place at Rock Cut Road on his first visit to the murder site. He was also among the activists, family members and politicians honored in a 50th anniversary prayer ceremony at the rebuilt Mt. Zion Church on June 15. “People have a vision of Philadelphia as a hell hole of the world,’’ Molpus said, in another talk a day later in the state capital of Jackson. Yet each time someone speaks out against racism, he said, his hometown changes for the better. 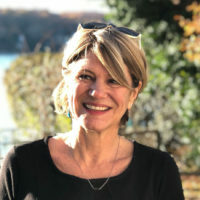 For her part, Winter mentor Emily Dannenberg will leave a state that once scared her too much to visit with new hope for the next generation of activists — and newfound respect for Freedom Summer volunteers 50 years ago.